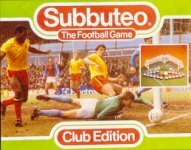 The full text listing of Subbuteo football accessories. These illustrations come from the lovely 1981 catalogue, and show a huge choice of editions to suit every budget. In keeping with the era, the players in these sets were now likely to be lightweights. Underneath the new lids the sets do not differ from the late 1970s versions, with the exception of the new World Cup set. 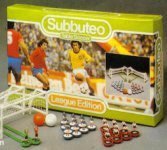 Same as always, the standard Subbuteo set. No change here either. 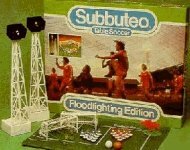 The standard Subbuteo set with floodlights. This was not the return of the old International set. 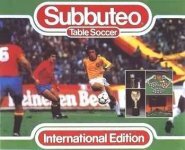 It was simply a new name for the 1978 World Cup Edition. the change of name was required, so that it didn't clash with the new FIFA World Cup edition mentioned below. This again was the same as the previous edition, although the illustration shows it with the new Police set (C159) rather than the old one, which had been phased out by this time. Arriving in 1981, this contained a pitch, two international teams, two championship goals (C181), two FIFA balls (C183), and the FIFA World Cup (C182). The teams were the World Cup hosts (Spain ref 48) and the holders (Argentina ref 67). 1983-84 Waddingtons "Table Soccer" sets. This era can be a little tricky to work out, because the posters from 1983 to 1985 do not show the boxed editions. Luckily, it appears that Waddingtons simply re-boxed the existing sets in brighter colours, but kept the contents pretty much the same. 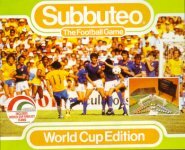 This was produced in 1983-84 to replace the FIFA World Cup Set. It featured Germany (ref 445) and France (ref 461) in fifteen man squads. However, rather than having two goalkeepers on rods (as in the squad team boxes), these had one rodded keeper per team, plus a pair of spare goalies (61106). The set also featured the tournament goals (C154), and two tournament balls (C167), plus the fence surround (61108), and a set of number stickers (61206). 1985-86 Waddingtons "The Football Game" sets. 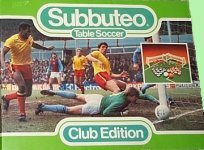 By 1985, the League, Floodlighting, and Stadium Editions had left the range, leaving only the Club and International sets. These were joined by the new World Cup Set, which replaced the European Edition. 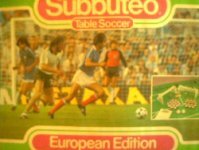 I have not illustrated the the Club and International edition boxes because they differ from the previous ones only in a change of sub-title (from "Table Soccer" to "The Football Game"). The pictures and colours are the same as before. There are other differences internally, as the large flags (C117) are replaced by the small ones (C188). The new set was the World Cup 1986 Edition, which was a replacement mid-range set. It retained the fifteen man teams from the European edition, but added a scoreboard. As can be seen, the Waddingtons catalogues of the late 1980s showed a big reduction in boxed versions. In fact 1987 had the lowest number of sets of any year, with just the Club, and World Cup sets available. 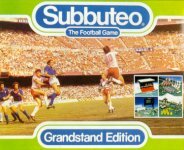 This improved in 1988, because the arrival of the red and blue stadium saw the introduction of the Grandstand Edition, which was a cut down version of the old Stadium Edition. A new colour for the logo, but otherwise no change. For completists, there were in fact two alternative bottom sections with this box. The early one had white sides and pictures of how to play. 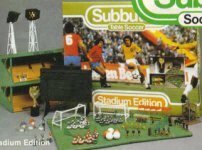 The later one had green sides with Subbuteo logo, whilst the bottom is dominated by a picture of a Subbuteo layout and the new stands. 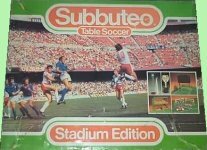 The stadium edition had ceased by 1984. This new version was produced in 1988 to capitalise on the new red and blue grandstand. However, it is a smaller set than the stadium edition. It had two polystyrene layers, with the existing World Cup layer on top, and a deeper layer containing the stadium and extras underneath. Included were three teams, stadium grandstand (61216), scorboard , fence surround, tournament goals, line flags, bench set, ball boys, police set, referees, photographers, film crew, corner kickers, throw-in figures and a number sheet. However, it lacked all the bigger accessories of earlier sets - no cups, no floodlights, and no TV tower. 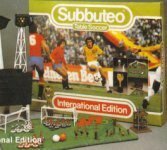 The set lasted until 1989, when the stickers on the box changed to the 1990 World Cup. Follow the links to reach the 1990s.